Do you want to put ads on your websites? Everyone wants to see the good rank of their websites so that they can put adds in order to earn money from it. However, All blog owners not familiar with the advertisement, how to make it active. In this post, we learn about how to add Google AdSense to your website or blog. The idea of earning by the blog is great and one should have to go with the “Adsense”. Google AdSense is the most popular online advertisement service, you can generate revenue from third-party ads on your website. Let’s initiate with the knowledge of Adsense segments that makes money before learning to add AdSense to WordPress. Google AdSense is a free and popular advertising service from Google, You can easily add Google AdSense to your WordPress site and start making money. So, Google Adsense is a CPC (cost-per-click) advertising program, whenever the user clicks on the add publishers will get paid for clicks on those ads appearing on their websites. The amount received per click varies based on a variety of factors. OK, ya! this is going to be fun. 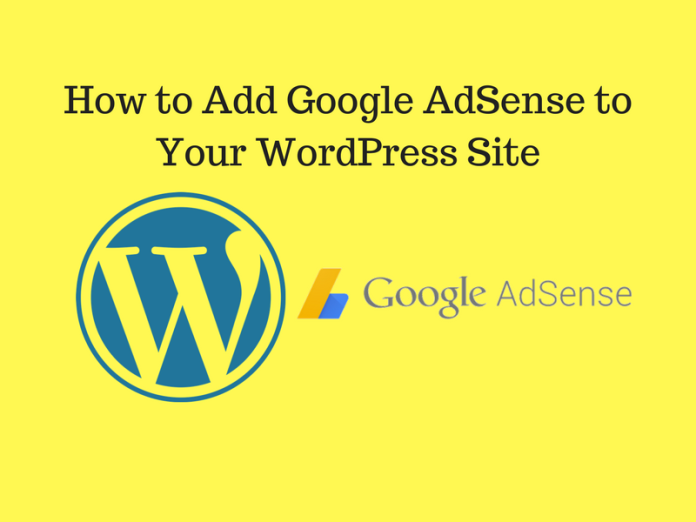 Here, I guide you step by step how to add Google AdSense to WordPress. Firstly, All you need to do is sign up for a Google AdSense account. In the previous post, we learned about Google AdSense and how to create Google AdSense account. However, it can take up to 3 days for Google to check and approve your application and soon you will get your ad code. If you have Gmail account – you may use it. Read More ⇒ Here Is How to get Google AdSense approval on your blog? Next step is to click on the My ads tab and then click on the New ad unit button.You can customize your ad and make it more suitable for your website design. After that, you should choose the type of your add i.e ‘text and display ads’, ‘In-feed ads’, and ‘In-article ads’. Finally, give the name to your add which is only for publisher concern not, select size, style, and colours. Ad sizes play a vital role impact on the view of your website. It’s recommended to select Responsive if your website is adapted to all devices. Next, completing all these steps press Save and get the code. A new window with your Adsense code will appear. It is very important to place your Ad properly on your site. Generally, Ads are placed on the sidebar, you can also place your Ad in the header, footer and between the content of the page. So, you probably know about the widgets, Widget is a small block that performs a specific function. You can use the widget to add Google Adsense to your sidebar. You can also use the plugins like Quick Adsense to use Google AdSense service on a WordPress website. Quick Adsense allows you to put multiple banners in your page, no matter if they’re from Google Adsense or any other Ad service. After installing the plugin and going to the settings page of Quick AdSense, you will be presented with the page as seen in the screenshot. Now you’ll only need to copy the AdSense code from the Ad code box and paste it into these boxes. Note: I recommend you the best sizes of your Ad are 336×280 and 300×250. These ads favour to fit on most screen sizes and have the best pay rate as well.